Recently, the weather has been dreary, gray, and cool. I love days like these, perfect to sleep and contemplate. 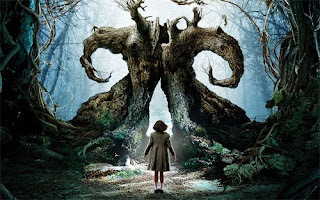 I was thinking about what to post and Pan's Labyrinth popped into my mind because of it's own dark imagery. It's such a visually captivating movie and I really relate to Ofelia. Though, I've been blessed with a peaceful life, unlike her, I understand how someone can be slowly pulled into their own fantasy world. Her's just happens to be richer, stranger, and very morbid. I love the costumes of the movie too. 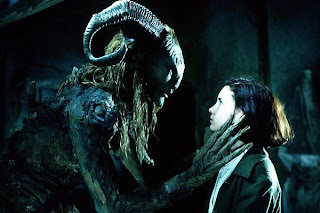 The faun-like creature, Pan, seems so very old, like he grew in the first forest, uprooted himself, but is still very feral and not at all human. He's the version of Pan that I choose to believe in, wild but still all-knowing. This movie is something that will stay with you forever, because of its violence, courage, and strange beauty. If you don't have the stomach for blood, it's not for you, because it is a movie set during wartime. I still get teary eyed when I hear the lullaby, and I think that's exactly what this film was meant to do.